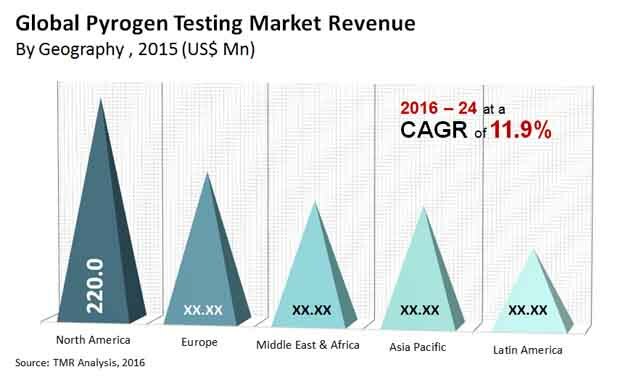 The competitive landscape of the global pyrogen testing market is an extremely consolidated one. Thermofisher, Charles River Laboratories International, Inc., Lonza Group, and Merck KGaA collectively held a share of 51% in the global market. Genscript, Hyglos Gmbh, Associates of Cape Cod, Inc., and Wako Chemicals USA, Inc. are some of the leading players operating in the market. The established players are anticipated to maintain their leadership as they are concentrated on strategic acquisitions and mergers and on developing products that do not necessitate rabbit pyrogen testing. A case in point would be Thermo Fisher Scientific, Inc. In March 2016, Thermo Fisher Scientific collaborated with the University of Birmingham in the U.K. to supply a range of advanced mass spectrometry instruments to the center for research purpose. In the same year in May, this company acquired FEI Company, a high-performance electron microscopy company. This acquisition is likely to help the company strengthen its presence in the global market. According to the TMR report, the global pyrogen testing market is anticipated to grow from its original valuation of US$570.0 mn in 2015 to US$1,527.8 mn by 2024, and is likely to advance at a CAGR of 11.9% within the forecast period of 2016 to 2024. Geographically, the global pyrogen testing market is led by North America. In 2015, this region held a share of 38.6% in the market. Key players in the market have a strong presence in this region and are making huge investments in research and development, which is the primary factor driving the growth in North America. In addition, favorable support from the governments is also fuelling the growth of the market. Developing economies of Asia Pacific and Latin America are also expected to grow over the forecast period due to their progressive medical tourism. In terms of tests, the limulus amoebocyte lysate (LAL) test is being extensively implemented by several drug manufacturing companies. It is expected to grow further in the forecast period as it offers the best quality control. This testing method is being used for detecting the microscopic quantity of bacterial toxins or pyrogen in pharmaceuticals, medical devices, and other areas. The global pyrogen testing market is driven by several factors, the key one being the advent of biotechnology and pharmaceutical companies across the globe. In addition, increased investments in the development of new drugs to improve healthcare is expected to impel the demand for pyrogen testing. Rise in incidence of chronic diseases, coupled with introduction of innovative drugs, launch of biological products, and favorable government initiatives will supplement the growth of the global market. Moreover, the market is expected to develop further owing to growing expenditure on healthcare, favorable reimbursement policies, and increasing responsiveness about chronic conditions. On the other hand, the market is expected to face a major a setback due to ongoing efforts to ban animal testing. Plus, high costs of tests such as Monocyte activation test (MAT) will exacerbate the market growth.